So today, I finally had a little time to take a peek at this space and yet again, its been a while since I last posted here. I'm still getting my head around the what's where here in Sydney and will post more about my findings soon. In the meanwhile, I found that I still have a few recipes in my drafts, this is all from before we left Mumbai. Things were so hectic then, that I hardly had the time to share some of these recipes with you. Well, now is as good a time as any. So in the next few days, I'll be finally posting some of the stuff I'd whipped up earlier. This cheesecake was requested for, by my brother. He had a friends birthday to attend and the birthday boy is a big fan of cheesecake, hence the request. This recipe is one I hadn't tried before, so I literally had my fingers crossed while this was coming together. I actually made a second tiny cheesecake, so that we could taste it too. The cheesecake was a complete hit. We at home loved it too, so I know for sure they weren't just trying to be nice when they complemented it. I heard that at the party there was quite a scramble for it. There were a couple of pieces set aside to take to someone, but apparently a couple of the boys were found in the kitchen gobbling them down. All that was left were crumbs. Its always so nice to hear that. That's what keeps me baking. I followed the recipe I found on Easy Meal Planning for the cheesecake. I didn't however, have the time to make the sauce for the topping. This cheesecake was originally supposed to be a Blueberry Cheesecake, but my brother who was supposed to pick up a tin for this specific purpose, picked up a tin of Blackcurrant pie filling instead. So we decided to use it anyway. Waste not! Want Not! This cheesecake had to travel about an hour to its destination, so all I did was use the dull side of a knife to loosed the edges of the cheesecake after it had cooled completely. Then I placed a glass on the table and the cheesecake tin over it just to demould it completely. I simply picked the ring up again and then added the topping. I wrapped it all up nice and securely at the base and covered the top with some al-foil. It reached safe and sound. You can either use the food processor and lightly crush the biscuits till it resembled coarse bread crumbs or you can use a rolling pin. I used the food processor to save time. Tip the biscuit crumbs in a mixing bowl and add the melted butter. Stir till it is incorporated well and starts to look like wet sand. Press this mixture into the bottom of a loose bottomed cake tin (you could also use a spring form pan if you have one) and let it come up the sides as well. How high you let it come depends on how you like your cheesecake crust. Avoid making the crust too thick where the base meets the sides. Bake for 7-10 minutes till it has lightly browned. While this is happening, you can start mixing your filling. Make sure the cream cheese and the cottage cheese is near room temperature and not chilled to get a nice, creamy texture. Blitz the cottage cheese in a blender with some milk / cream till smooth and creamy. Do not over beat. Beat together the cottage cheese, the cream cheese, sour cream and the sugar. Add the egg yolks and continue to beat. Add the zest and the vanilla essence and beat till it has been incorporated well into the mix. Beat the egg whites till they hold soft peaks. Fold the beaten whites into the cream cheese mix. Pour the mix into the baked biscuit shell. Wrap a large piece of heavy duty aluminium foil around the base of the tin and up the sides. Place the tin in a roasting tray. Carefully, pour boiling water in the roasting pan till it reaches halfway up the side of the cake pan. Carefully place the roasting pan in the oven and bake for about 40 minutes or till a skewer inserted in the middle of the cake comes out just clean. Remove the foil from around the tin and let the cheesecake cool completely. Now you can demould the cake and add the topping. 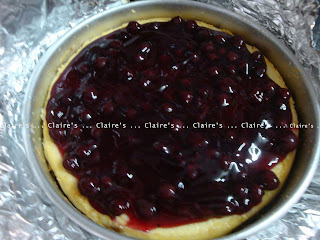 I used a tin of black-currant pie filling/cheesecake topping. Thanks Deepa. I did the packing but my bother did the travelling with it. This is a great cheesecake, I just love the blackcurrant. Thank you so much for sharing your awesome recipe with Full Plate Thursday. Hope you are having a great weekend and come back soon!